We all know that we live in uncertain times. Whether you are in your home, in your car, at work, or on the street you have to be prepared to defend yourself. I do not want to sound like the world is coming to an end and it is every man for himself, but you still have to be practical. The simple solution is to get a conceal and carry permit and carry a handgun. However, the issue is not always so simple. Some people cannot afford a handgun. Others cannot get a permit or do not wish to go through the hassle. There are some areas when carrying a gun is not a legal option. On the other hand, some situations do not justify killing somebody. If three or four assailants started a shoving match with me I would not want to kill them, but I might want to avoid a trip to the hospital. Some people are not comfortable with the idea of killing at all. Every person has to decide what they are willing to do to defend their families and themselves. There are other scenarios to consider. What happens if you are caught unprepared and cannot get to your gun? It is always nice to have a backup plan. If you are sitting at home you may not have your gun on the table next to you, but having something non-lethal may make more sense. Here are some of the top non-lethal weapons you can use for self and home defense. This product is small, light, inexpensive, and effective. Pepper spray uses a variety of spices and chemicals to blind a person before they can cause you harm. It is easy for a person to keep pepper spray in their pocket or purse, and has been used for decades. The two biggest advances that have been made are in the potency and the distance from which you can be effective. Many of these sprays have a great deal of pressure behind them and can be accurate at up to 10 feet. The beautiful part about pepper spray is that it disables your attacker and it temporarily blinds them. It puts your attacker in the optimal condition for you to safely escape. The only real downside to pepper spray is wind. If used in windy conditions it could easily blow back in your face, so it is best used indoors. It is reusable, and a typical can should be good for around 35 uses. When the cost is less than $10, it is a great deal. SABRE is the brand most often used by law enforcement. It has proven to be 30% more effective than competing brands. This means the pain will be that much more likely to put your attacker on the ground. 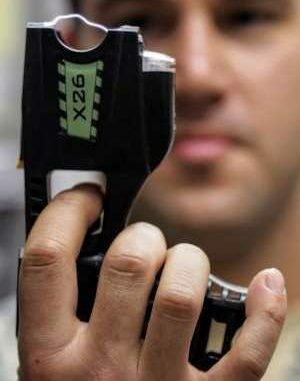 Pepper spray should be a serious contender when you look at non-lethal weapons. This device is not quite as risky or messy as pepper spray. It delivers over 30 million volts into an attacker to instantly put them on the ground. It does require you to get close enough to your attacker to apply the electrodes to their body, so you have to be comfortable getting in close quarters. The biggest downside of the stun gun is the range, while the disabling force is really unmatched. It instantly interrupts the nervous system of the attacker rendering their arms and legs useless. Stun guns are also quite affordable and can normally be purchased for under $20. I remember back in the day when Mag-Lights were considered self-defense weapons because they were so long and heavy that you could beat somebody over the head with them. These days there is a better option. Small tactical flashlights are great to blind your attacker when somebody comes at you. My own blasts an LED beam at 1000 lumens. This is great when you are tromping through the woods. It is also strong enough to temporarily blind an attacker. In addition to its standard function, many tactical flashlights have a strobe feature that will keep blasting your attacker with light. This puts them in an even more disoriented state. Mine is completely waterproof so operation in the rain is no concern. It also has a beveled edge which will serve as an excellent striking weapon if things come to blows. While you can spend much more, mine was less than $20. I would buy exactly the same one if I ever had to replace it. A stun baton is often used by police or security officers. It combines the power of a stun gun with the range of a baseball bat. One of the biggest concerns with a basic stun gun is that you have to get close to your attacker. They could easily stab you if they had a concealed blade, or you might get accidentally stunned yourself. The stun baton allows you to reach out from several feet to send around nine million volts into your attacker. Many have a flashlight built into the end for better visibility and the option of blinding the attacker. It is also heavy enough that you can use it like a baseball bat if absolutely needed. These non-lethal weapons have come down considerably in price and can typically be purchased for less than $50. I know it may seem a little futuristic or extreme, but sometimes you just want a gun. You may want to be able to knock somebody down from across the room without killing them. The bean bag gun could be the option for you. The weapon is both spring-loaded and gas-powered. A nitrogen cylinder launches the bean bag at 135 feet per second. The purpose of the gun is to keep your distance and put your attacker on the ground. The bean bag will easily knock the wind out of just about any person coming your way. It is as simple as pointing and firing. The only real downside is the cost. One of these self-defense toys will set you back around $200. Keeping in the realm of weapons that allow you to keep your distance, the pepper spray gun is an interesting option. This gives you the blinding capability and disabling pain of pepper spray. However, it also has the look of a handgun so the appearance may scare away your attacker. It fires at a whopping 320 feet per second. This is about as fast as a major league fast ball, so the rounds sting. The rounds themselves are small compressed balls of powdered pepper spray. Here is how it works. You pull the weapon and the attacker freezes. He sees what he thinks is a gun and is instantly surprised. You fire a round and it reaches your target faster than he can blink his eyes. The pain on impact is intense, but a cloud of dust is created. The attacker is now blinded and drops to his knees in pain. There cannot be a much more confusing or disabling scenario for an attacker. This weapon is actually accurate at distances of up to 150 feet. This makes it the longest range non-lethal option we have reviewed. However, because it looks like a gun it is not legal in every state. It will also cost you almost as much as an actual handgun. If you like the idea of the stun gun or the stun baton but want more range, the Taser is the option for you. This device is effective at up to 35 feet. It delivers the same 9 million volts as the baton, but keeps you at a very safe distance. The device fires barbs at the target with wires attached. The barbs stick securely into the skin of the attacker, and the wires deliver a blast that will instantly disrupt the nervous system. Many law enforcement agencies use these devices, especially when dealing with people under the influence of drugs or alcohol. However, be prepared for a hefty price tag. This is by far the most expensive option we reviewed. There are a few other non-lethal weapons that should be considered in your search for the best option. Do not discount the good old baseball bat. This weapon is simple enough that virtually any adult can use it. Just pick it up and swing. It is inexpensive and plenty intimidating against somebody that is without a firearm. It is just a bit bulky to take out of the home. Tactical pens can be a good choice for non-lethal self-defense. However, they are the only option we considered that requires some training or skill to use properly. In inexperienced hands, a tactical pen is likely worthless. However, if you know what pressure points to strike on an attacker and how to strike, you can easily put somebody on the ground. They also look like any other pen, so you can carry one without drawing attention to yourself. A dog is another good option. While it requires ongoing care, dogs are naturally scary to intruders. They make noise, and many will defend their owners. They are again hard to take out of the home. Perhaps a security system is your best bet. There are dozens of options available these days for home security and for personal security. Do your research and find the one that works best for you. Take a two ounce tear drop shaped lead fishing weight, sew it in the back of your ball cap with dental floss. To use just grab the bill of your cap and apply vigorously to the attackers head. Trust me, they will never see it coming. Now, THAT, is a decent “field expedient” idea!!!!! Wasp Spray. Has many functions including killing wasps. Feel threatened in Walmart throw a can in the cart.